For JessicaJanson : Thanks for your comment, it’s a pleasure to help. I give you two suggestions for the numbers : the first one is following the same order than in English, and the second one is following how an Elf would write it (backyard). 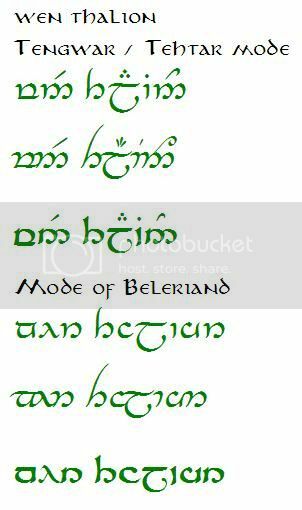 You can remove the dots above the numbers if you want… officially, dots are not necessary because the numbers are already very different from the other Tengwar, but some people prefer to put them to emphasis the fact that they are numbers. At first greetings from Austria. I need a transcription of the name Jennifer! Thank you very much Isildilmë, I'll post photographs of the tattoo when it's done! For Jutta : I received this request by email (it wasn’t possible for Jutta to post it here). 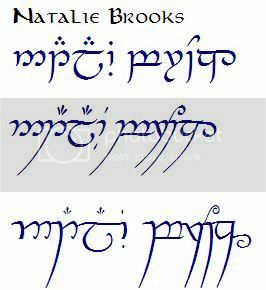 I show you the two ways to write Sindarin with Tengwar. For Philotes : Hi ! Once again we can see the wonders of the net ; connecting people on all the world with a click . 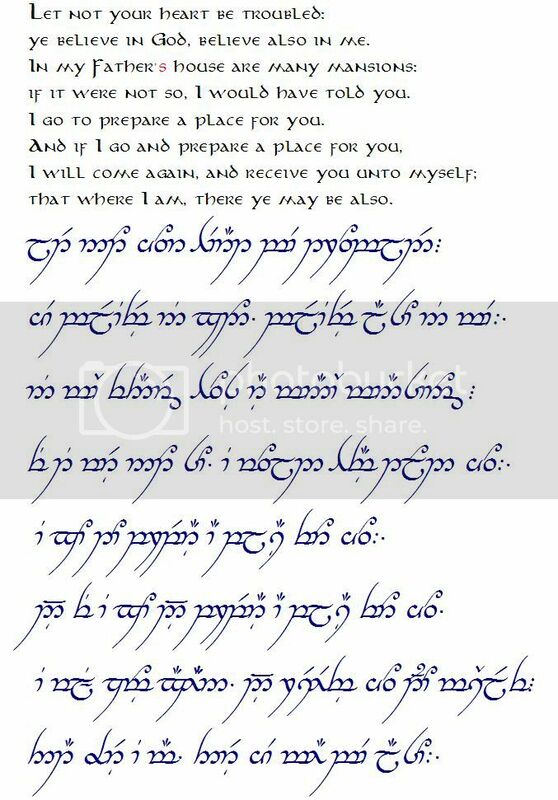 Anduril92 wrote: Thank you very much Isildilmë, I'll post photographs of the tattoo when it's done! 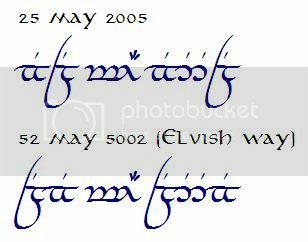 Isildilmë wrote: For Altair0823 : I want to tell you that I had no choice to treat the names as English names… but the result still says the same : “EU-G-ENE” and “Y-EV-G-EN-IY M-EL-N-YCH-UK”. 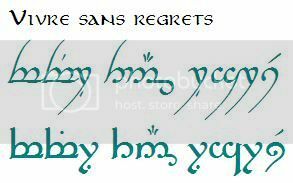 It’s juste that there is no “code” to transcribe your language into Tengwar, so I use the code for English to transcribe them letter by letter. Great! Exactly what I wanted. Thanks, Isildilmë. Thank you so much Isildilmë! It looks perfect It's so great you do this for others! 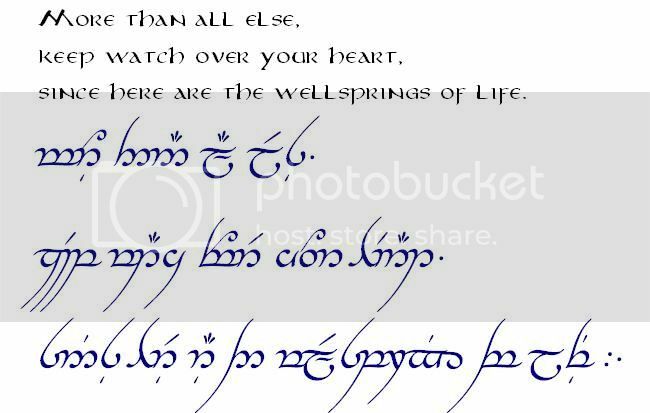 Would it be possible to get a larger picture of my translations in black font ? If so that would be fantastic. And you're definitely an "important character" on TORC, especially since you're actually doing something LOTR-related. Thank-you very much for the transcriptions, No comes the hard part of picking one . I will hopefully post up a picture of the finished product when I get it done, although that could be a while since tattoo's are expensive and i'm a student! Je dois par contre t’aviser que comme il n’y a pas de symboles connus pour l’apostrophe, j’ai dû simplement le supprimer (« cest »). I'm curious as to why you used calma instead of hwesta for the "ch" in "watch". Care to help me learn? Katyenka wrote: I'm curious as to why you used calma instead of hwesta for the "ch" in "watch". Care to help me learn? In some source hwesta is also proposed for "ch", but often more for a "k" sounding "ch", as in Christ, for example. And in many sources they don't even propose any use for it, so I tend to use it the less possible, and to keep careful doing it. I often prefer to use calma for any "ch". I don't know if it answers your question... and I don't know if my explanation is clear enough (that is one of the problem with my bad English !). If you have sources that you would like to share with me so we can discuss about it, it will be a pleasure. And to everyone who posted today, I would like to answer each one of you, but my time doesn't permit it ! So thank you for this feedback, I'm pleased to see that you like my work. I hope to see the pictures of the result, as soon as you'll can bring them to life ! Papelitsa and Anduril92, I saw your requests, and there is no problem. And thanks GwenElf, I really appreciate. Very grateful, thanks very much. As you may see, the last line (different color) is a repetition of the preceeding line. I just changed the punctuation, to show you two types of punctuation that can express a “larger pause – end of paragraph”. You must choose ONE of the two. I hope to see this art caption when it’ll be done ! Hi, you guys do awesome work!!! I was wondering if I could get some stuff transcribed. "If you only love me in my dreams, let me stay asleep forever." and "I will never let you fall." 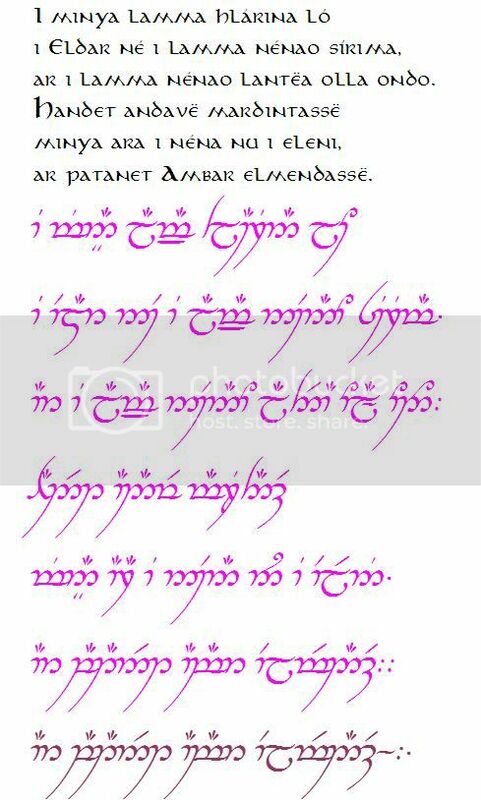 I'd like them all in Tengwar Annatar italic. i post a photo when i do my tattoo! Isildilmë wrote: For broox159 : That is what I call an interested person : going through the whole thread (and the first !) is a proof of patience and interest, and I thank you for this. Thank you for your comment on it too ! Thank you so much! You are awsome! I shall be sure to post pics once I have my tattoo! !